Although Welwyn Garden City was not founded until after World War I, there are links to that conflict by those who came to live here. In 1925, when it was just newly built, Captain Arthur Kelly arrived at No. 6 The Quadrangle where he lived until his death in 1937. His mortal remains, alongside his wife (to be confirmed) rest at Hatfield Hyde cemetery. The obituary notice published in the Welwyn Times of 6th May 1937 reads like a “Who’s Who” of the movers and shakers of the early days of the town. Captain Kelly was obviously a well regarded and respected member of the community. 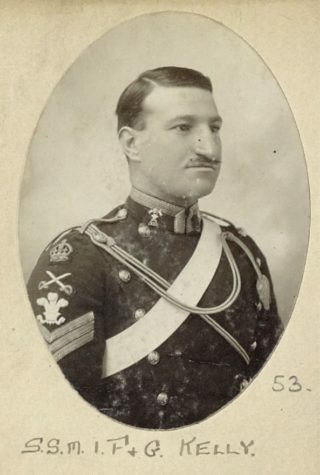 The references in the obituary to “the Beloved Captain” refer to another military man, Captain Ronald Hardy, who in 1914 was given a commission in the Rifle Brigade, the 7th Battalion in “Kitchener’s Army”. He earned the respect of his fellow soldiers and this soubriquet was recorded by Donald Hankey in “Student at Arms” essays. Captain Hardy was killed near Ypres in 1915, and Donald Hankey on the Somme in 1916. The essays are a chilling reminder of those battles. The obituary notice for Captain Kelly follows. This page was added on 26/08/2013. Why dedacate half of this to his boss? The regimental historian of the Royal Irish Lancers provided the following military record for Capt Kelly. It reveals a different age when the Empire was still very much in place. Arthur Kelly enlisted in the 5th Royal Irish Lancers in January 1901 aged 18 years and 4 months in Hull, having been born in Halifax on 11 September 1872. He had previously been employed as a postman. He was posted to India and the 12th Royal Lancers in 1906 where he embarked on his specialist career of a Gymnastic Instructor by qualifying in 1908. He served in India until 1910, after which he moved with the Regiment to South Africa where he stayed until 1913. He married his wife, Mary, in Durban, Natal in 1911 and on their return to England he also qualified as a Musketry Instructor. They had two children, Mary (born 1911) and Grace (born 1913). Sergeant Major Kelly went to war on 21 August 1914, a week after the main party of the Regiment had departed. He served with the Regiment throughout the war and was awarded the Meritorious Service Medal for his services (one of only five in the Regiment). He was commissioned in the Royal Field Artillery in November 1915 and it was while in this service that he was gassed at Passchendaele in 1917. He was evacuated to England where he made a full recovery and continued to serve until his retirement in 1921.